Gravel Grinder News: Salsa Cycles 2019 Models- by Guitar Ted It’s that time of year again when we learn what is coming for 2019 from many manufacturers. 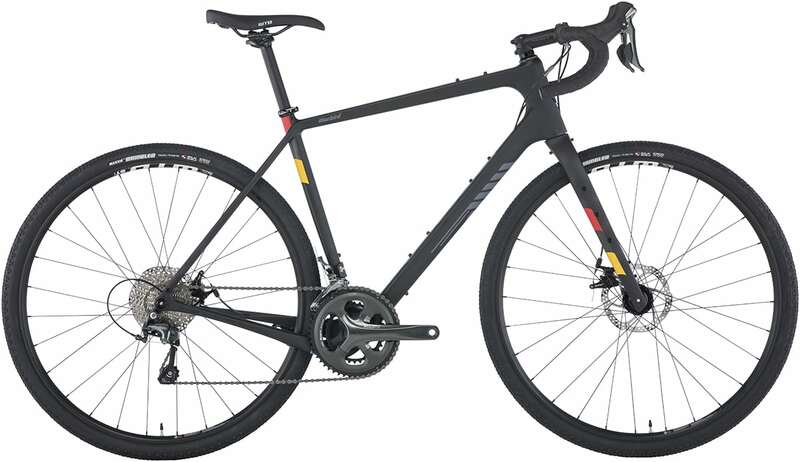 This time we learn of the models offered for gravel/ back road travel by Salsa Cycles. The new Warbird v4, the upgraded Vaya, and the new, higher end Journeyman will all be featured. There will be a word about the new Fargo and Cutthroat models for 2019, but these models basically are not changed significantly. Here we go…….. The alternate color for the 2019 Vaya. 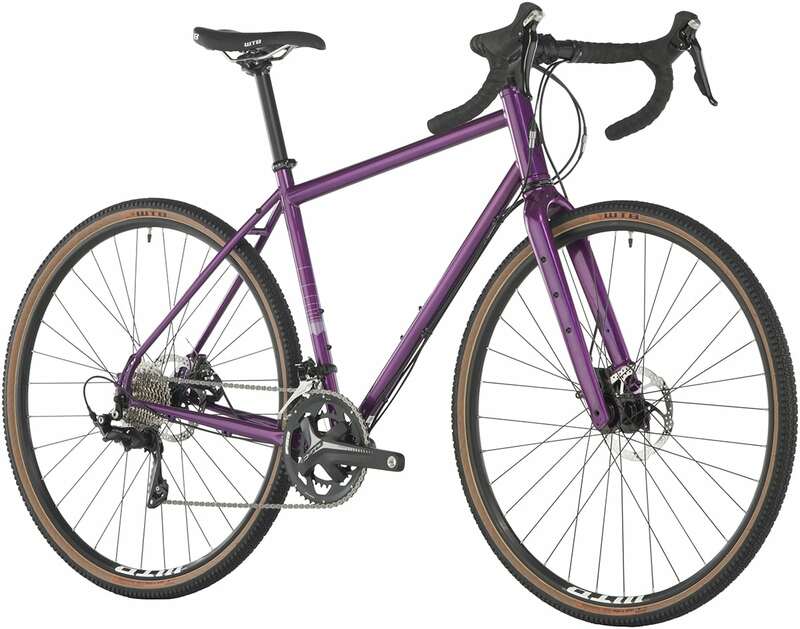 Vaya: The Vaya is arguably Salsa Cycles’ first “all-road gravel bike” having come out in 2010. Gravel racers and riders were attracted straight away to the Vaya’s steel frame and versatile braze on attachment points for racks, fenders, and an extra water bottle under the down tube. Over the years the Vaya received only minor upgrades and was overshadowed by the company’s own Warbird model as a gravel travel machine. But despite all that, the Vaya should not be overlooked by those looking for a reliable, versatile bicycle for any road. The 2019 model year sees some of the biggest changes to the Vaya overall. The offerings have been pared down to one spec level and a new fork now graces the front of this bike. The Vaya now will have a similar fork as the new Warbird v4 bikes, the Carbon Waxwing fork, which has a 12mm through axle, Three Pack bosses on each leg, and a ton of tire clearance. The fork is also capable of having fenders mounted and will be internally routed for those who wish to run a dynamo hub. Running gear consists of the new 105 11 speed drive train with a wide range, FSA crank set sporting 48/32 rings turning an 11-34T cassette. Brakes are the excellent TRP Spyre calipers with 160mm rotors. The kit is finished off with Salsa Cowbell bars, Salsa seat post and stem, and WTB skin wall Riddler tires in the 37mm width. That color! The new, higher end Journeyman Apex with 650B wheels. Journeyman Apex: The newest model in the all-road/gravel travel segment for Salsa Cycles is the Journeyman, which was introduced earlier this year in Spring. The initial offerings of this model were value oriented, entry level spec, but now Salsa has introduced a higher end spec level for this bike dubbed the Journeyman Apex. You probably can guess what the spec of the drive train is by the name. 1 X 11 drive train featuring SRAM Apex, check! The Journeyman Apex will follow along with the rest of the Journeyman models in that the Apex level bike will be offered in both 700c and 650B models. 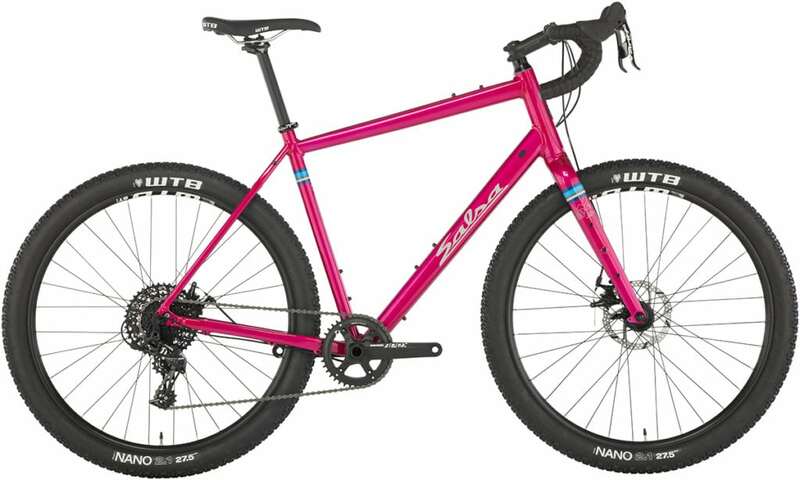 The 650B model in the fetching pink color is most eye-catching, but if you want 700c wheels, you will have to sweet talk your local Salsa dealer into a possible wheel swap. We’ve heard that’s a possibility with some dealers out there. For those who aren’t into bold colors, the more subtle shade of green offered in the 700c wheels should do nicely. Both come equipped with TRP Spyre-C flat mount disc brakes and have the carbon Fantail Deluxe fork. Another thing worth noting for 2019 is that the flat bar version of the Journeyman will now only be offered in the Claris level spec, which is the entry level of the Journeyman range. Color choices remain the same going forward for all other Journeyman bikes for the 2019 model year. The all new Warbird v4: This one is the range topping Di2 Ultegra build. Warbird v4: We’ve drooled over and have seen the Warbird v4 ever since late May of 2018 when Salsa sponsored riders were seen out at certain events riding the flashy colored prototypes. We gave you a sneak peek at what the production model might be from our “All Things Gravel Expo” coverage last June. Now we finally get to see the actual bikes for the coming year. 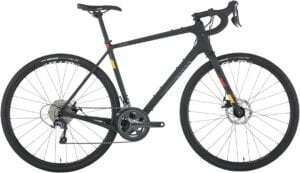 The new Warbird will be offered in five spec levels from a range topping, Ultegra Di2 at $5399.00 down to a Warbird Tiagra retailing at $2399.00. All models will have the same frame and similar forks. While a lot of people were hoping that Salsa would offer that eye-catching paint scheme seen on the prototypes, the closest you’ll get is the grey-scale version of that scheme which is offered up on the Ultegra Di2 model. Otherwise the paint schemes are all similar- a take off on the original striped and wheat icon motif that the Warbird models have sported since they were introduced. With five spec levels, there is a lot to cover here. But first, let’s take a look at what is similar across the line of the Warbird v4 range. All new frame from the ground up. The new Warbird has more stand over clearance due to a lowered top tube featuring a bit more slope than before which made the rear triangle more compact. This does not affect compliance as it was factored into the new design. Class V VRS ride is tuned for each size in the range. The top tube and front center have been lengthened slightly which lends more stability. A high modulus carbon used with the redesign has shaved off 100 grams from the previous generation’s weight. A new, smaller size has been added to the size range to accommodate more riders. The frame features fully internalized cable routing and internal dropper post routing. Bottle mounts- Size 56cm and larger will feature two water bottle bosses inside the front triangle on the down tube and one bottle mount on the seat tube. Smaller sizes will have only one bottle on the down tube and seat tube. All sizes get one bottle mount under the down tube. Top tube bag direct mounts for strapless top tube bags so equipped with this feature. Frame geometry accommodates for use of a Fox AX suspension fork or Lauf True Grit fork. Carbon Waxwing Deluxe and Carbon Waxwing forks: The top two Warbirds in the range will get the full carbon Waxwing Deluxe forks while the rest of the range will get the Waxwing fork. All are internally routed for dynamo hub wiring, have tapered steer tubes, have three pack bosses on each leg, can have fenders mounted, and have clearance for 700 x 45mm or 650B X 2.1″ tires. The forks will have 12mm through axles, flat mount disc brake mounts, and will be suspension corrected for the Fox AX fork or a Lauf Grit fork. Frame also has dual wheel size compatibility- 700 X 45mm or 650B x 2.1″ tires maximum. Worth noting is that there will no longer be any aluminum Warbirds offered. This makes sense to us as one could say that the new Journeyman fills that niche rather well. Otherwise this is the most extensive range for Warbirds we’ve seen. It is also the most versatile Warbird ever offered. Rack, fender, fork cage mounts, vast tire clearances, and dual wheel size compatibility make this bike cutting edge in the gravel/all-road market. 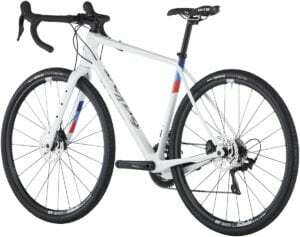 Of course, you probably have noticed the dropped right side chain stay, a hallmark of the newest crop of gravel bikes. This allows for that big tire clearance and for better mud clearances between the chain rings and the outside of the right chain stay. Some may not like the new ” versatility” and wish for a more “race specific” Warbird like the old versions, but we do not agree. If anything, this bike opens up more options to racers than the old design ever had, plus, it is lighter. The extra mounts certainly do not get in your way and having more tire clearance is a welcomed thing in wetter races where the older Warbird design suffered. Add in the options to tune your ride with bigger tires, different diameter wheels, and even a suspension fork if you so desire, and we cannot see why having these options is taking away from the race pedigree the Warbird has had since its debut in 2012. Fargo-Cutthroat For 2019: We know that these bikes are aimed more at the bikepacker/mountain biking scene, but we see enough of these bikes used as gravel bikes that we thought we’d mention what’s up for 2019 anyway. 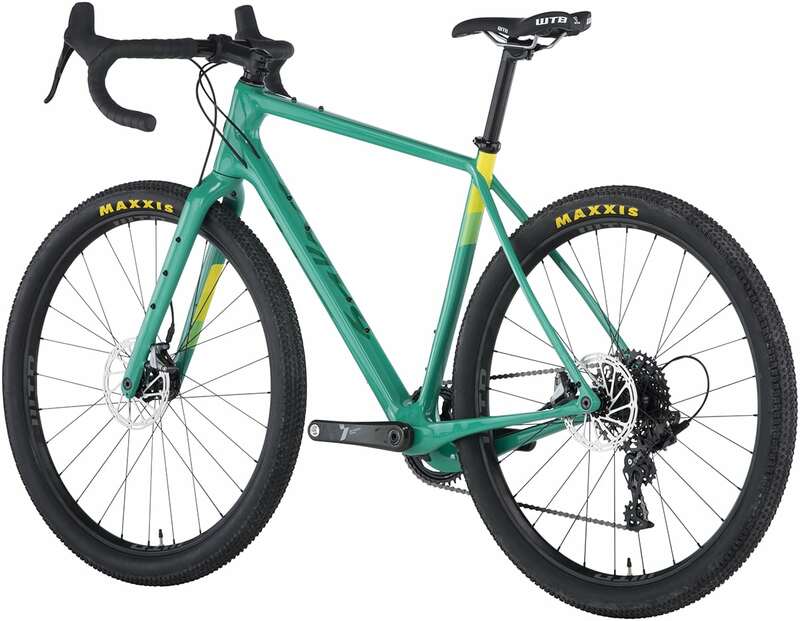 Basically, with regard to the Fargo, Salsa is spec’ing all models with 29″ X 2.6″ Maxxis Ikon mtb tires and the 650B+ option is not offered stock for this coming year. The Fargo still retains the same frame as it has had in 2018 so 27.5+, 29+, and 29″ wheels are all compatible. The split for the belt drive option also was retained. Models offered are the Fargo Apex 1 and the 2X Fargo Tiagra. A frame set is also offered. No mention of the titanium Fargo. All Fargo models will have a new Firestarter 110 spaced fork, (read “Boost”) and the Apex 1 will get the “Deluxe version”. Both versions have carbon legs and are routed for dynamo wiring. The Cutthroat models are all SRAM 1X drive trains and some new paint schemes. The big news here is the addition of the Cutthroat Apex 1 Sus model which has a 100mm travel Rock Shox Reba fork. Comments: So obviously what is noteworthy here is the brand new Warbird. We’ve already had several things to say about this new version of the Warbird. This new model fits in with a trend we’re seeing. What we see overall is a shift in what is seen as a “gravel/all road bike” in the marketplace for 2019 and moving forward. Gravel bikes, ever since there was a category called this, have been more road oriented in nature, and rightfully so. Most of what we like to ride are, at their most basic, roads. That said, a more mountain bike-ish trend is blurring the lines between what could be said was a gravel road bike and what is a hard tail mountain bike today. See what Salsa Cycles did with the Fargo- they made it more “mtb” with the spec of 2.6″ rubber. The new Warbird has dropper post and suspension fork capabilities. 650 mtb tires will fit many of these newer “gravel road” bikes. This doesn’t take away from the “road” part in any way. With the gulf between what is a road bike drive train and what is a mountain bike drive train being a gap you cannot cross easily, or at all, the “road” DNA, if you will, of the Warbird is still there, albeit with a few mtb trappings. Still, it will be interesting to see where this new turn in design for these bikes will take gravel/all road bikes in the future. Overall the new Journeyman spec model and the Warbird steal the show, but don’t forget about the Vaya. It’s a nice spec bike, does a great job on gravel, and can be a pretty decent light touring rig if pressed into service that way. It might be the sleeper in the 2019 line up. Salsa Cycles set out to be a player early on in the gravel scene, and with this new 2019 line up, they have sent out a message that they fully intend to be a major player in the scene moving forward. Are they going to offer the warbird in just a frame set? 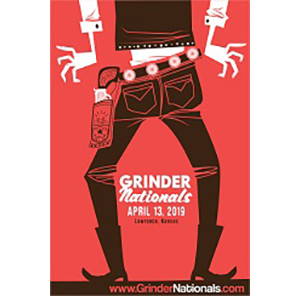 @Gregory- Yes, frame sets will be available for the Warbird, Fargo, Vaya, and Cutthroat models, (sorry! No Journeyman frame sets) All frame set only sales will be in black. 24 lb 14 oz for a Carbon framed tiagra????? Let me go look some 4130 frames again… I mean holy SHEEET! Yeah, agreed! I think that the Vaya is better bike at that same approx. weight. Steel + higher groupset for less money. Any idea what front derailleur they are using on the Fargo Tiagra? They don’t say in the specs and it shows a Deore mtb double crank and Tiagra STI shifters. 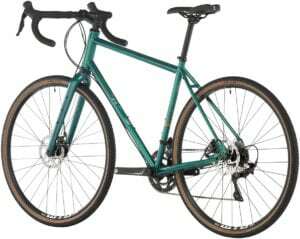 Salsa has really upped their game for 2019 Gravelbikes! I’ve been hoping for a 650B Gravelbike with a 1x drivetrain and now I have some choices.